When I kick-started my editing adventure with Urban Lives, I followed my ambition and determination to explore better national territory through its Street Art, free and acceptable for everyone. It also defined a purpose to travel over new cities and countries, discovering places, routes and districts that I would probably never even consider to visit. Therefore Urban Lives has changed my way of traveling as well: my trips became more frequent, itineraries are always more complicated, luggages are lighter and lighter each time; everything I do, comes from the will to create a special connection with local artists and people, to look into scenes and record all stories I was told and experience I had. 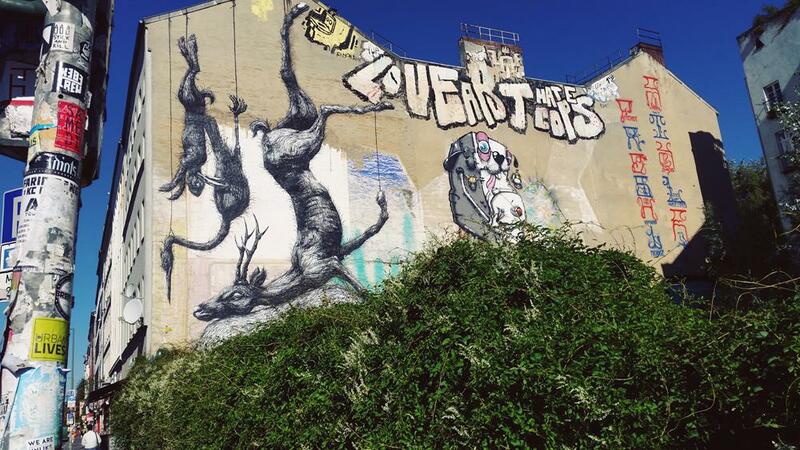 First two years of Urban Lives I travelled all across Italy, focused on inner-city art of national territory: for love to my country and for support of local street art movement, I totally gave up on going abroad. It was like that until one day, almost a year ago, unexpectedly for me, I found out that people from other countries checked me out: some artists from abroad started contacting me, at first just for greetings, then for a proposal, then for a request to help out with some travels in Italy. First meetings and first chit-chats with foreign artists, like Kiddy Citny, Dzia e Skirl, triggered a new desire in me – to commit myself to advanced path of discovering and researching, which could be focused mainly on cultural differences between artistic scenes and different movements. I broadened my horizons towards new destinations with a strong will to meet, as always, local artists who would show me what they witnessed through their stories, their lifestyle and its underground culture. 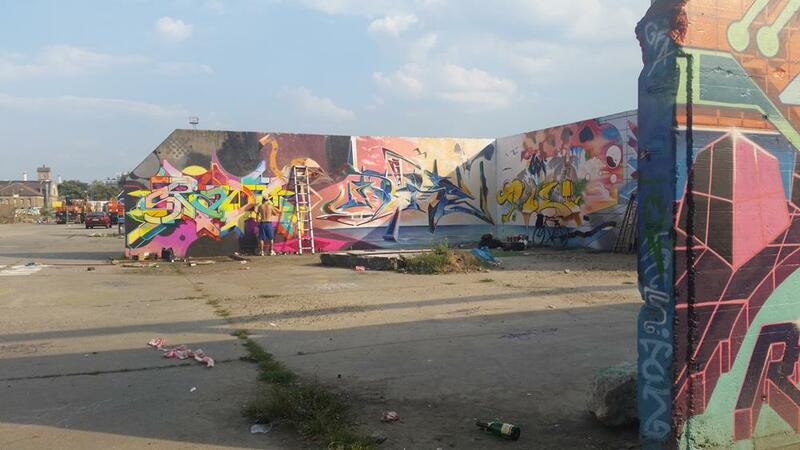 The first step of this new project could not ever been anything but Berlin, the city that started history of underground and graffiti in Europe. 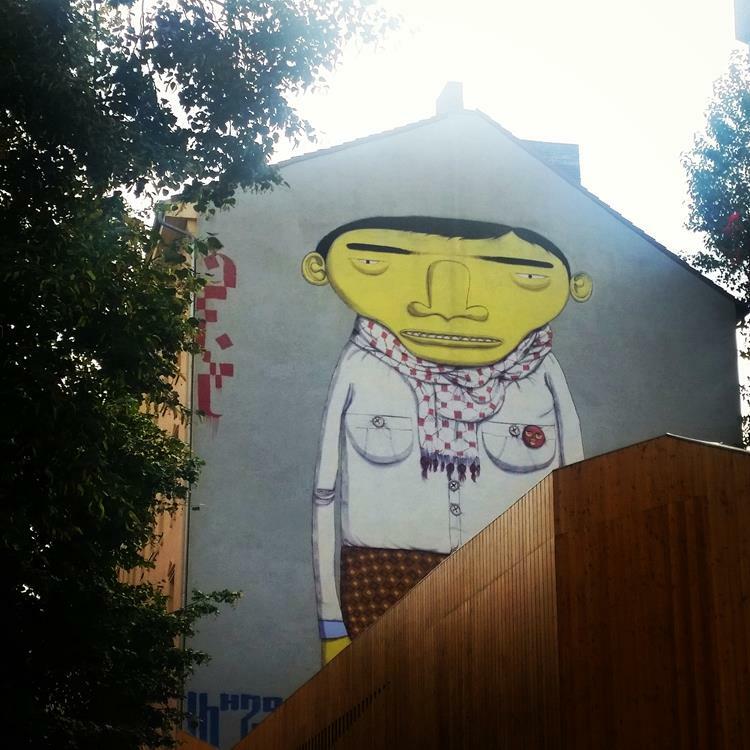 When I decided to departure, I was inspired by painter Kiddy Citny (‘a dinosaur of street art’ or the first one who painted onto Berlin Wall together with Therry Noir; we’ve previously met in Paris where I interviewed her for Urban Lives), besides of that, I didn’t have a clear idea how to plan my journey. Everything I had was couple of contacts and some appointments, some recommendations from friends and Italian artists (whom I thank a lot!) 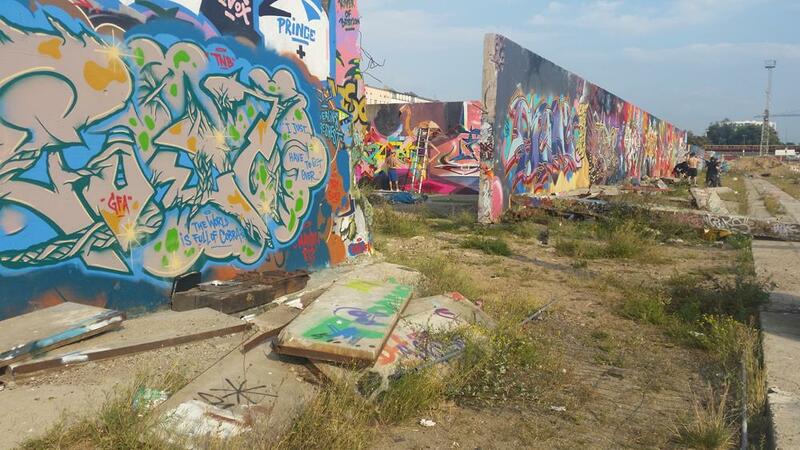 and also local bloggers and painters, my will to finally observe with my own eyes some places and historical mild stones of graffiti and street art, a desire to travel non-stop on that metro, which a saw a lot in the videos of my favorite group 1UP. Especially these guys were the second concrete reason of my trip: I’ve already knew, thanks to a common contact, that I’d probably be able to meet them during my week in Berlin, and that ‘probably’ was more than enough to go on this adventure. Everything has started from August, when I was trying hard to write and to work during the whole passed summer, so I decided to take one-way ticket (I had 16 free days and it wasn’t clear to me where to go after Berlin) and to rent an apartment in the heart of Kreuzberg, the district of 1UP, as well as the ‘coolest’ neighborhood of the city (like many Germans would comment then). Only later I made up my mind to add another week-trip to Athens to my journey, but I’ll tell you later about it. Just three days before the departure, I’ve found out that my hypothetical meeting with 1UP was confirmed, and it was expected to be exactly on the first day: seemed like a dream to me and I could screen to the whole world, but I preferred to keep it in secret. Afterwards three days before the trip, I spent constantly thinking about all these things I’d love to ask them since started following their group, so I discussed it with only some trustful friends, among whom was Pietro Rivasi. In addition to this meeting, I had a scheduled appointment with the kindest Kiddy Citny and with another artist I was in touch with for long time, Berlin citizen Ken Plotbot. Long story short, for going to unknown city alone and without speaking German, I was sure to have an exciting trip full of emotions. I can’t explain why but when I arrived to Berlin I immediately felt like home, and I this feeling became even stronger when I reached Kreuzberg: for being here just once when I was 18 year old, it was the coldest trip in winter of which I remember just several sight seeings, those places appeared familiar to me, like a few other times during my trips. Perhaps, also because of this feeling I decided to spend whole afternoon checking out the neighborhood, hunting for the pieces of 1UP and street art in general; thankfully, it was a hot summer day, so I spent an hour in park, among many young people who were drinking beer, chatting and sunbathing there. I took plenty of pictures, moreover a couple of pieces made with an extinguisher amazed me; while walking around, I was thinking of questions for the interview and I had a flashback of my friends’ advice to ‘keep your head always up‘, otherwise I risk to come back to Rome with a stiff neck or to hit a pole on the street (almost happened to me several times). Thinking of upcoming evening with 1UP, asking myself how many people I’d meet and where would we go: I have just one address and one place where I could imagine it happening. That evening in the end was simply fantastic: two amazing hours talking to historical members of 1UP (check out the interview). It was one of the most beautiful and significant meetings of my life. I was right before, it worth it to travel to Germany only for this meeting; and for this I have to thank from the bottom of my heart one extraordinary person who put us in contact. 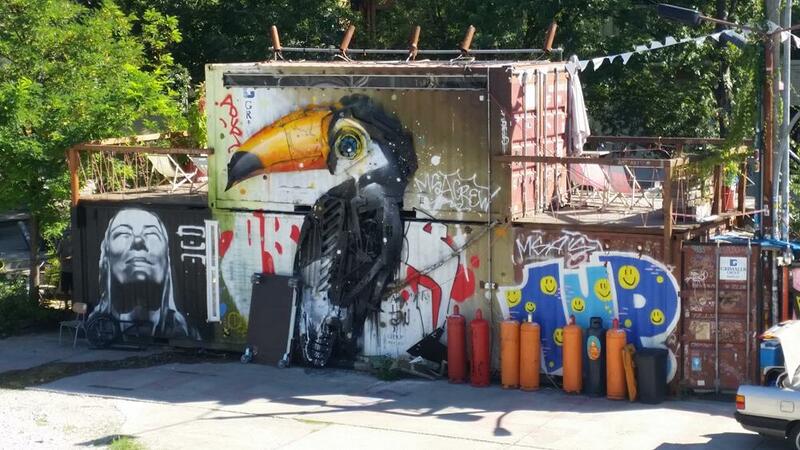 The second day, still smiling after last night with 1UP, I spent wandering in two main neighborhoods of street art – Kreuzberg that I still hadn’t finished exploring, and Urban Spree. Many kilometers passed under the sun, many of Urban Lives stickers attached around, a lot of murals I knew before from photos and which I finally could chance to see in real. Following the order more or less, I’m walking from one district to another, which makes it possible to admire enormous number of graffitis, like those of 1UP and Berlin Kidz, some of them next to each other, or like in case of that famous facade which Roa also painted on. 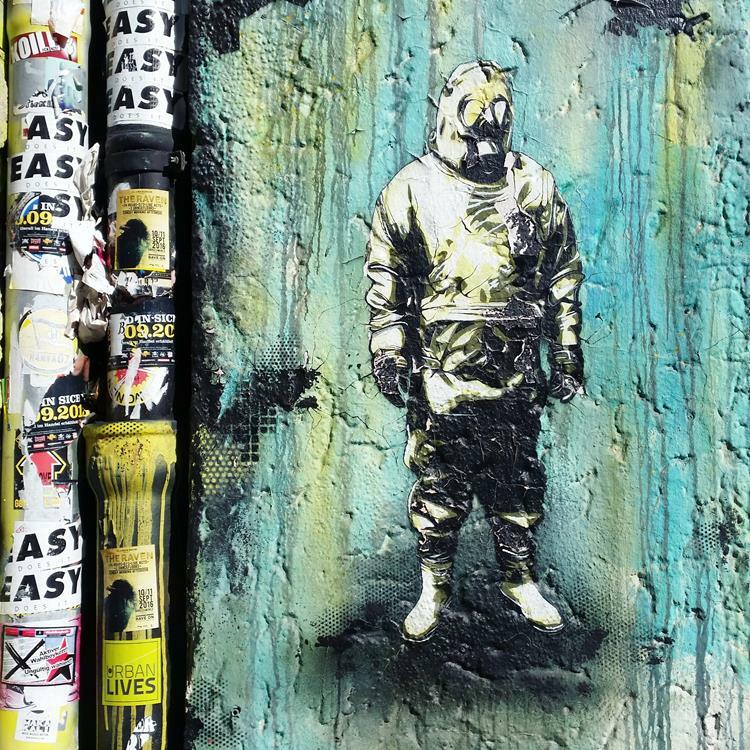 There are many stencil with dancing women by French artist Sobr, or those different ones of a man in gas mask by Ken Plotbot, side by side you can see some posters, like those of Italian artist Snem. Speaking about big murals, more or less legal works to mention, those are ‘Berg Astronaut’ by Portugal Victor Ash, and one small piece by English Stick behind trees, an extraordinary work by Blu named ‘Pink Man/Leviathan’, situated in Oberdam Bruke, the ‘Yellow Man’ from my favorites of Os Gemeos (in Oppelner street 3, No10997), and just a crossed the bridge , the works of TWOONE, Bordalo, Jimmy C and Zabou. 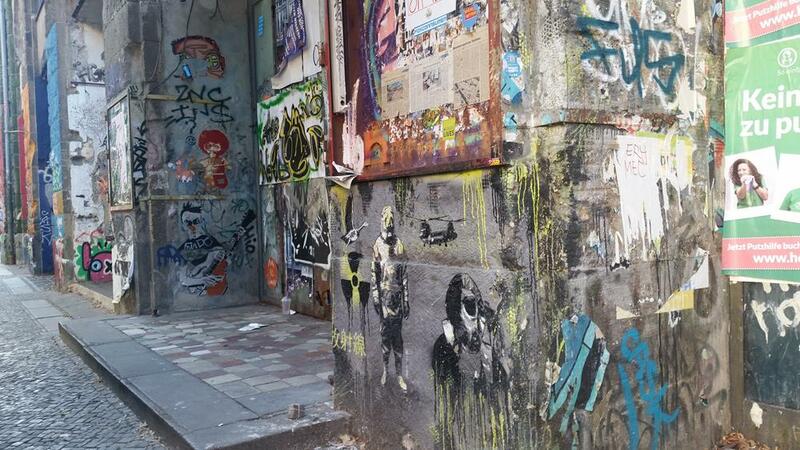 Well, a beautiful walk representing one of many possible routes to hunt for street art. At the end of the day, I was happy again about the destination I’ve chosen and thanking everyone who suggested or guided me on a distance by messages, among them all – the photographer Robby Rent. A day after I had a pleasure to visit the studio of Kiddy Citny, a big and bright apartment surrounded by greens and silence. It has been five months since our previous meeting and yet it seems like just very little time has passed. We are talking about everything here: his current and future projects, about this summer that we both spent mainly alone, concentrated on our job. We pause to talk more about Berlin: he tells me that from cultural and artistic point of view, it is a very inspiring city. There are many museums, galleries (the number of them can probably be equal to the number of churches in Rome) and many events of any kind that art lovers would be in every day hesitation which vernissage to choose or which exhibition to visit. 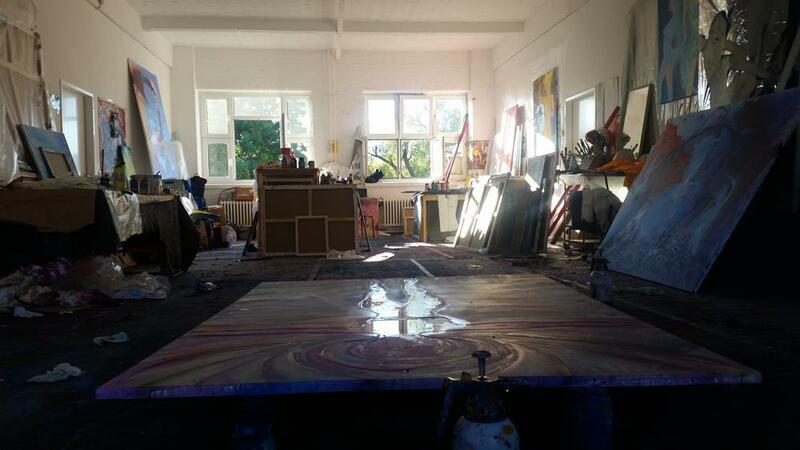 However, the negative aspect of very active city is not being late to come out and confirm that over the week there will be other artists: the thing is that local collectors and owners of galleries do not focus on German artists. 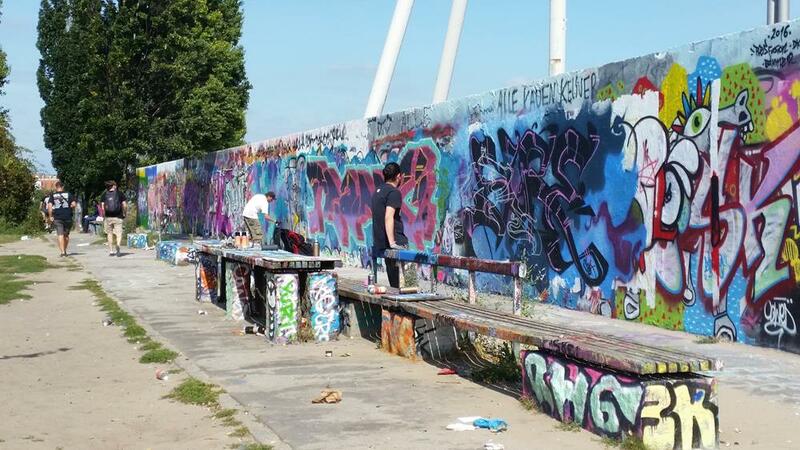 Thinking of this issue, I suddenly realized that even street art pieces, expect for graffiti and some minor works, were almost all made by artists from other countries. I finally understand why so many Germans travel frequently and perform abroad, and I really find it absurd that even if they live in an upscale city like Berlin, they should aim at other markets. Surrounded by beautiful paintings of Kiddy, some of them much bigger than I thought they were, and their details and technics are almost impossible to observe through photos, I ask him many questions about his art and I find myself next to him checking every single painting he made in the last period, practically like having a private presentation. He tells me he loves a lot bright colors and pastel, especially ‘shades of Naples’ of yellow and pink (would be interesting to understand why they’re called like that); choosing a color scheme is usually a key phase of working on his creations, and it can take a lot of time. In his works he also loves to use water, like me he adores the gradient effect. He suggests me to pay attention to various layers of colors, to the elements more or less hidden in pencil drawings, in carefully selected strokes that accompany main objects but are equally important to him, and not least in tracks and engraved parts, which make the pictures even more alive and interesting if you observe them attentively and close. Turns out that working on a canvas may take a day or a month or even more: sometimes he likes to start several paintings at the same time, and if he has a lack of creativity with one, he can switch to another without problems, and later to go back and finish the first one. For example, he decides to demonstrate me how he carries on the realization of one big canvas that represents an angel: with a certain musical accompaniment, rock and punk mostly, I observe him and take pictures while he is adding water and new color elements, drains the painting and then puts other marks and elements. We also start singing together while working on it. There is a break to dry the canvas between one phase of painting and the other, within which we continue to talk and we loose count of the time chatting about travels and adventures. He tells me, for example, when he painted in the Castle of Bari and of Milan, he had a chance to fall in love with Italy and he had a pleasure to meet Blu, and I, as usual, use this opportunity to speak also of other artists of Italian scene and show him some picture (spreading Italian art and culture is inevitable part of my travels as well as creating connections among artists). 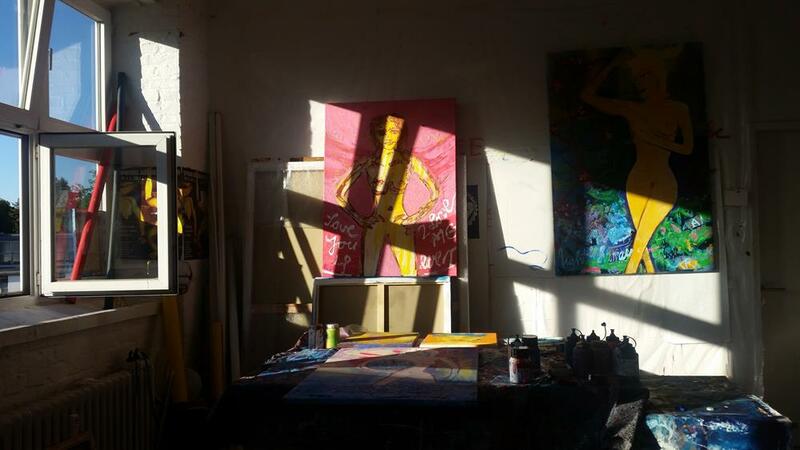 When I ask him whether he still performs with his group, a well-known Punk band ‘Sprung a us den wolken’, he surprises me when he tells that they often organize performances during the vernissage of his exhibitions and that he loves to sing during the live painting. He thinks back then when he was touring in Europe and living in squats, in Berlin and in London: he tells me of the days when punk, rebellion, occupations, political struggles and excesses were authentic, usually accompanied with drug abuse, they were constructive bonding among young people, something that is lost in time now, like a desire to stand out, even on a creative level, to fight for and share ideals. After that long conversation and unquantified number of cups of American coffee, we move out from the studio and when it’s about to sunset, he takes me for a ride in the neighborhood, shows me a caffe where he worked when he was young and where he had so often chatted with David Bowie and Iggy Pop, described by him as ‘always talented, kind and a bit stoned’, and for a big joy of mine, we go to Indian restaurant for dinner. The sun goes when we finish sipping our spiced tea, and when we say ‘goodbye’ arranging appointment for another day, he farewells me screaming ‘ciao!’ while riding away on the bike… And it seems extraordinary and normal at the same time. 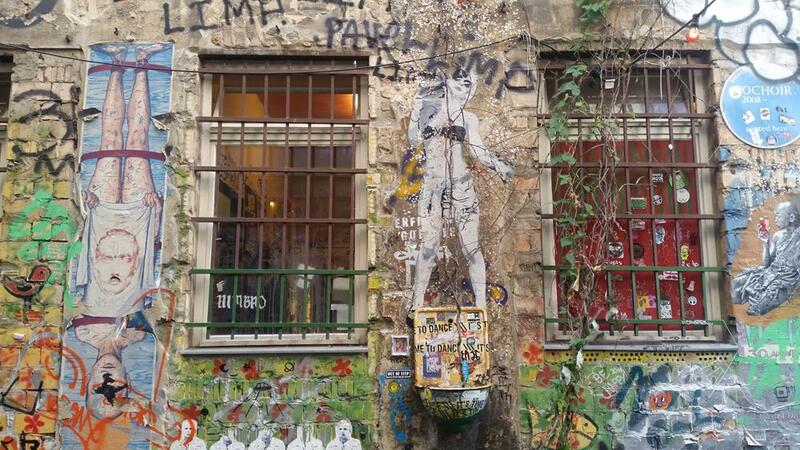 For the next two days I resume my wanderings to explore the city and its urban art. 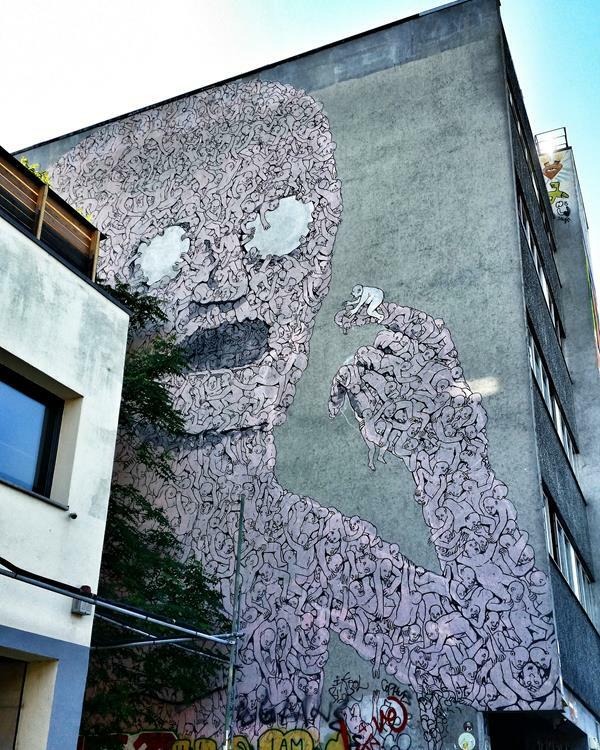 The morning of my forth day I decide to go in the direction of Hackescher Markt, in Mitte district, to hunt for several works, one of them is by Ericailcane (the part of Bastardilla was cancelled). Firstly, I get lost starring at the stands of a wonderful small market, and then get lost for real because I can’t find the address which was shown to me. I ask the directions from two kind German girls who want to help me, but the right guidance eventually comes from Italy, from my friend Robby Rent (my lifesaver!). That’s how I’m finally inside of Rosenthaler Street 39 inner yard where you can find the museum of Anna Frank. What I see in front of me is stunning: everything is covered with stickers, posters, murals, and works of any type or size. 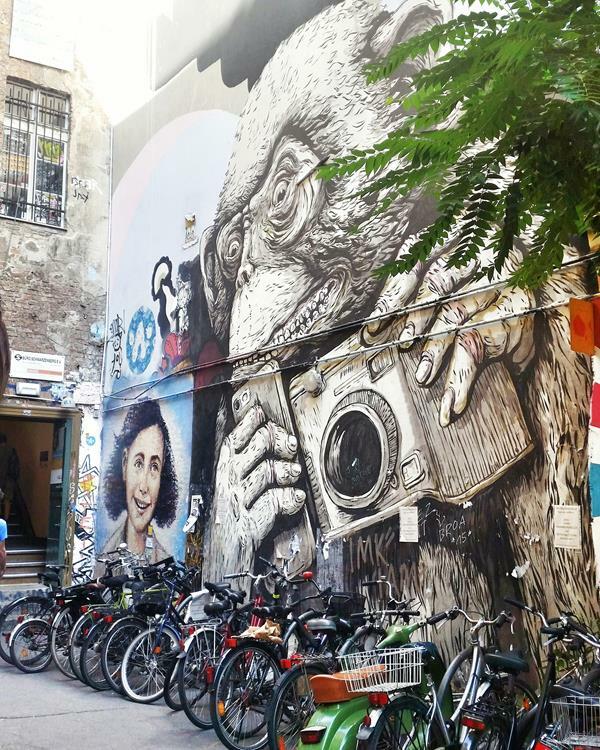 The place of honor, next to the museum, is reserved for the Australian Jimmy C, who made either the Anna Frank portrait, and the amazing monkey by Ericailcane, the one who seems like frightening people walking across the street trough a photo camera or a phone. While taking picture and applying some Urban Lives stickers, I finish in the middle of a German guided tour about street arts: I’m so curious about it, that I’m waiting for a pause to introduce myself to the guide, a nice guy with a perfect English pronunciation. We talk a bit about Ericailcane, he tells me it’s one of the few pieces survived during the years of numerous coverings; he suggests me a free tour that takes place each weekend but, unfortunately, I wouldn’t be able to attend it. The fact that the tour is free makes me feel really good, because guys of 1UP on the first day told me that there are many activities trying to make money on this in “the city of street art” with cheap or expensive tours but worthless with their quality. From there I start walking to one of the few touristic places, even if it wasn’t related to a purpose of the trip, the Nature Historical Museum: James Kalinda suggested it to me, because of one strange room full of scaring upside down fishes in jars, and after collecting some information I decided to go. This was simply amazing. During my walk, I followed streets moving randomly from one corner to another, as a result, I find an ex-social center, abandoned at the moment but full of nice and classic street art works, and probably empty houses and new buildings walls full of nice graffiti: basically, that afternoon proved that art is everywhere and that it’s really needed to walk without a plan to enjoy it totally. The day after I decide to add, among all other routes, also a walk along the Sprea river before the sunset, starting from the old bridge close to the Blue mural and walking to the famous sculpture, “molecular men” by Jonathan Borofsky, standing from far away, close to one piece by 1UP that I noticed from the subway. The walk gives me amazing views, and allows me to take pics of the famous Blu mural now covered in black, and makes me discover many nice and interesting places and buildings, really well designed by stunning architectural decisions and full of windows in which the sky reflecting itself makes you wanting to capture it in a photo. Moreover, even if I’m totally tired and suffering of a hill problem, I get a surprise in the last part of the walk. I meet a troupe filming what seems, impossible to understand for me because of language barrier, a hip-hop song taken in front of what people named as an historical Hall of Fame, while two writers in the background are painting a perfect lettering. Either because I was tired, or for the situation, I decide to be a bit far from the action taking some discreet pics, that I call the best of all trip. Another day finished and another full of emotions was about to come. 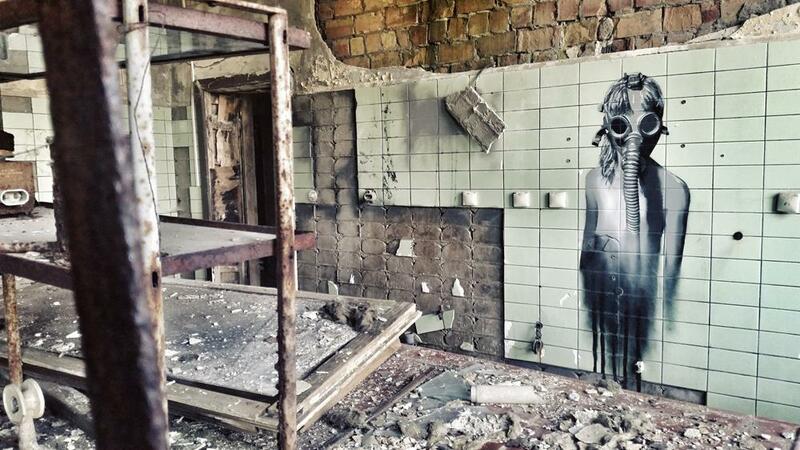 The day after, something I’m waiting for so long was expecting for me, I’m about to finally meet the berlin artist Ken Plobot, who gently offers to be my guide in some abandoned places he painted. It’s a busy and astonishing day, almost unreal: fireworks shops, environment and food industry damages to society, pics in destroyed rooms, long and intense speeches on street arts, on graffiti, on art in general and pics taken during sunrise at the train station before saying goodbye to each other; in one day I almost forgot that I’m in Berlin. It seems I am fading and floating in another dimension, checking on abandoned district, which was quite impossible to reach by my own. Ken Plobot is an amazing adventure partner, an even more than I expected, interesting and sensible artist, a brilliant person, full of enthusiasm and passion for art and life in general, someone with whom you can literally talk about everything. It is also undeniable that checking in real life his works, seen before on social networks, gives you totally another prospective. Colors of chemical stuff on the walls, ash and all different details are impossible to be caught in a picture… (coming soon a detailed article about Ken Plobot). Last day in Berlin, after an exciting week of life experiences, places, meetings and nonstop discoveries, happiness is equal to satisfaction: I feel like I couldn’t have done more than what I’ve done, giving everything to life each day at maximum; all in all, I already got the best from the trip. Following Lucchetto suggestion, first I stop ad Depot2, and hip-hop clothing shop in Kreuzberg where, besides buying the 1UP book I could get their own stickers. Moreover, maybe impressed by my “fan‘s eyes” I’m able to get a just printed poster. 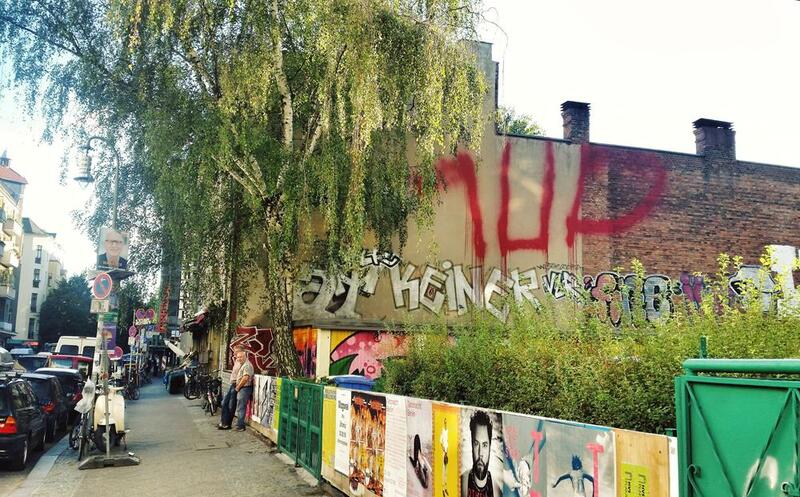 After dropping off all stuff I got, the only things I bought besides a skirt, I am moving to Mauerpark. 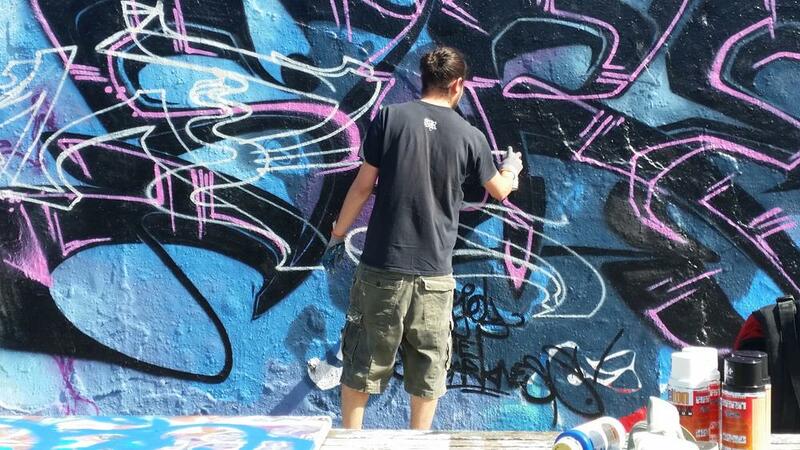 Here, as they told me, I find an amazing wall full of graffiti and some writers making their works. While waiting to have lunch with the only Italian person met in the trip, I stop by a small wall to sunbath few steps far away from a nice party, catchy, with DJ and barbecue. After lunch I decide to go to Alexanderplatz and then home to prepare my luggage before dinner with Kiddy Citny and one guy from 1UP. I expected a nice and quiet night, maybe spending some time in Berlin’s pub: I would never imagine what I was about to experience. Wearing my skirt bought in Hack Escher Markt and comfortable gym shoes (you never know what to expect when you go out with writers), I put a hoody and the 1UP book into my backpack and I move out. At the meeting, I find the 1UP guy with two young and super friendly writes just arrived from Madrid and they’ve just met, ice creams and the burgers, and all together, we reach Kiddy Citny. The night starts with a nice party in a club: many people, most of them are famous artists as was explained to me. Between one beer and another, creating a nice atmosphere: we talk about many stuff, either in English or in Spanish, and while waiting for a table to sit at, time seems passing fast. Suddenly the surprise: the 1UP guy tells me that he wants me to pass the last amazing special night and to make my dream come true at any cost, something I wanted since the first day I arrived in Berlin. He decides to take me painting a train, “something really simple and safe” with the Spanish writers. While smiling I am trying to realize what just happened, we say ‘goodbye’ to Kiddy who joined in the meanwhile some friends. We leave the party and, first of all, we stop by at the Spanish writers’ flat to grab all spray cans: I try to convince them I want just to watch or maybe take some pictures, but they convince me in the end to grab a can too. It was going to be a long night: so we stop by to grab some pizzas and beers. 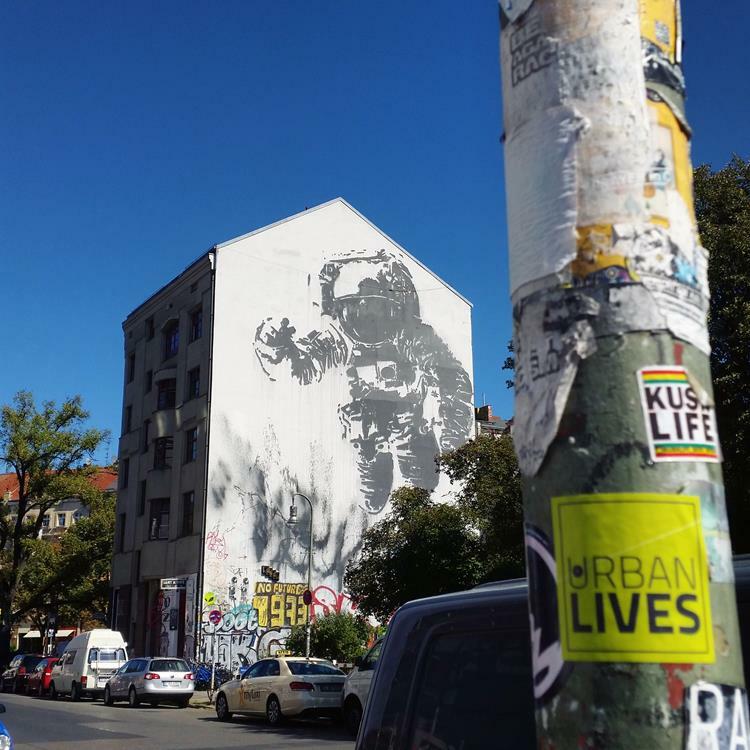 We keep exploring new districts of Berlin never seen before; allowing me to add more sightseeing, and while moving around the 1UP guy puts a dedication on my book. Once reached the train station he had chosen and after opening the gates, we finally are, hidden in the bushes, few steps far from the binary where the train was supposed to pass. We had more or less 20 minutes to wait, while we stayed silent and crouched, and just one minute to write on the passing train. As soon as the train arrives, we run to it without being noticed: while I write “Urban Lives”, obliviously, first thing I see it’s people on the train and then the 1UP guy writing with an unexpected speed seventh times the word 1UP. When the train leaves, we are running away fast and extremely excited. I do not know whether I will have again this kind of chance but for sure I will never forget what happened this night and I will keep forever this memory thanking the 1UP guy for this gift. After what just happened, no one wants to go home so we start drinking another beer talking and laughing a lot, the 1UP guy takes us for a ride to check on first works of his crew that surprisingly still survives the time. We all hug each other while also saying ‘goodbye’, hoping to meet up soon again between Berlin, Rome and Madrid. It is 5.30 in the morning when I reach home, in an exited state of mind that is hard to explain: I play some music, finish packing my stuff and rest for just 30 minutes before leaving to the airport. Happiness wins over sleepiness, that I can barely feel, and it is hard for me to think that soon I would have started another adventure in Athens. Once at the airport, while checking-in I sing a song: during the night, the 1UP guy filled our head with one of those catchy tunes that usually you keep in your mind for at least a week. While walking on the stairs to get into the plane, after a sunny week, rain starts. It is a sign: a marvelous period it has finished. I turn to say ‘goodbye’ and to thank Berlin, while a teardrop full of both happiness and sadness shows up on my face mixed with rain, I put my hoody on, the one for special occasions.